In the few months that I have had the Nexon with me, the furthest I had gone, until recently, was to Pune. While on those trips it promised to be a good touring machine, I wanted to give it a proper test. With a long New Year weekend in sight, I booked myself a short vacation in Udaipur, packed my bags and 10.5 hour later I was in the lake city. To avoid peak hour traffic, I started my journey at midnight. I usually prefer to drive at night, as highways are less populated by ignorant motorists or stray animals. But for a relaxed night drive, good headlights are non-negotiable. In that regard, the Nexon’s projector headlamps didn’t disappoint. Another reason why I could pull off an over 750km drive in such time was the comfort that the car offers. In those 10.5 hours, I made just two quick chai breaks and a fuel stop. The seats are so well cushioned and amply supportive that even those long hours didn’t leave me with a sore back or body pain. 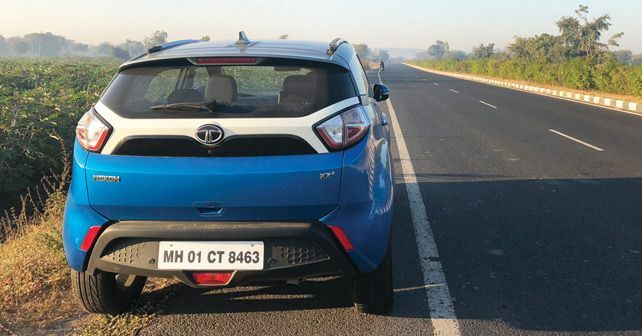 The Nexon’s engine too played a huge part in making the entire drive relaxed. The car doesn’t feel nervous or shy even at high speeds. A special mention must be made of the plush ride quality it offers. Even the wavy and jagged highway, while entering Rajasthan, didn’t unsettle the car or cause my any discomfort. The biggest and possibly the only irritant for me during the drive was the tall sixth cog. I found myself engaging the top cog only post the three-digit mark. Even speeds of about 90km/h would demand a downshift in case of quick overtakes.